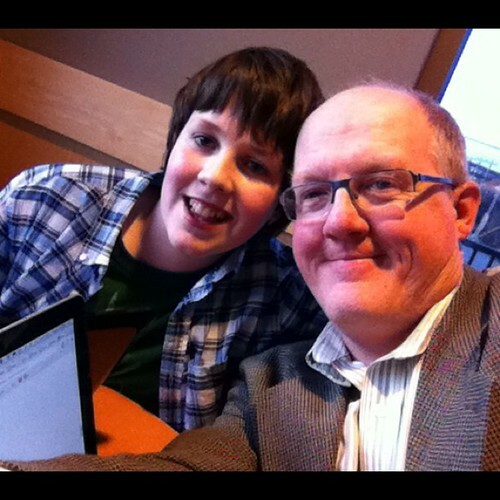 This afternoon, while Martha was off to a social event with her mom, Nick and I decamped to the coffee shop. It was his idea. We each bought brought a laptop; he's been flexing his own writing muscles, and is developing what he hopes to turn into a novel. It's his second go. I've been more than encouraging, as I've been studiously ignoring my own manuscript! Maybe I'll get disciplined when 2012 rolls around. In the meantime, we've had a great afternoon, sipping our respective beverages (coffee for me, milk for him) and chatting every few minutes. I came across this last week: a handwritten outline that J.K. Rowling made while she was plotting out Harry Potter and the Order of the Phoenix. Looking at how she has organized her thoughts, I almost want to read the book again. Another thought came to mind, though, and that's the story I'm trying to craft on my own. I'm now in the second in what's likely to be an undetermined (but probably much higher) number of drafts, and while I wrote an outline before I had a single chapter finished, I wish I had considered this kind of schematic. The plot of my novel - as it stands - happens with a period of a few months, and there are interlocking threads. I'm inclined to try this kind of a model when I have a few hours, to see if it might make reorganizing things that much easier. The real reason for going is that I stayed on after Martha and Nick went back to town. I took part in what's called the Piper's Frith, a writers' retreat organized by the Literary Foundation of Newfoundland and Labrador. My purpose? To delve more deeply into my writing, particularly on the fiction side, and - to be precise - to find out if the documents I have stored on my laptop could feasibly be turned into an actual book. As I've discussed here and there, I started working a year ago on a novel. I finished a first draft not long after I went back to work at CBC in St. John's in early March, but quickly enough ran into a tough reality: it's very hard to write creatively when you have a dayjob (and a demanding one), and are a parent, too. I came out of the Frith, though, with a new and better outlook on things. I was assigned to a group led by Jessica Grant, who wrote Come, Thou Tortoise, last year's Winterset winner and a terrific and hilarious book. Jessica is even funnier in person, and an inspiring writing coach. I'm also thankful for the advice and notes from our writing group; it was a surreal experience hearing them discuss characters I've created - characters I've told only my wife about - as if they were real people. That was one of the moments when the book came alive for me. The whole experience was clarifying. So, now there's an imperative: Get 'er done. It's going to take some time, and getting it published is going to be a whole other trial. But I can do this. Meanwhile, I heartily recommend the Frith to anyone who wants to get more serious about their writing. I was joined by a group that came from across the country, with very different styles, goals and experiences, and left with some new friends and a richer appreciation for what we're all trying to achieve. Sounds great! But ... which nation? I do hope that the generosity spreads across the border. I have actually taken advantage of wifi at local Starbucks without paying, but that's because I have an Aliant account and signed up with Starbucks, giving me two hours for each session. That's a fair bit of time, but when I was working on the book (it's not finished, thanks) last fall, and needed to get out of the house, I found that two hours flew by quickly. Yes, granted, I wasn't supposed to be surfing anything other my own thoughts, but I'd forget to suspend my online time ... and, well, you can guess what happened. The thing is, I've been getting used to getting free wifi at loads of places, often where coffee is served, but definitely not necessarily. The one I like best? St. John's International Airport, where I usually arrive more than a little early, and quite like getting stuff done before I squeeze into a metallic tube. A week or two ago, I passed a milestone. As I've mentioned, I've been spending my days (but not my nights, at least, not yet) writing what I hope will turn out to be a published novel. I'm treating the process like a job: I get up in the morning, and after breakfast and getting my son to school, I go to the living room with a hot mug of coffee, and get to work. To help keep track of things, and also to spur effort, I keep track of what I'm doing. Each day, I record the output (in terms of typed words) in a spreadsheet. I started doing this on Oct. 5, several weeks after I started writing the book, at least in a concerted way. I've found it very helpful to set targets: that is, the number of words I expect I should be able to create in a given day. It's been a good incentive: on productive days, I really do feel like I'm making headway, and on less productive days (including some recent ones where I was stuck in a chapter that was unforgiving), I figured out what I needed to do: just keep moving. So, earlier this month, I saw the "word count" total pass a marker of 100,000. That didn't mean I had written my 100,000th word - I did that weeks earlier, because I did not tabulate what I had written in August or September. It also doesn't mean, necessarily, there are 100,000 in the manuscript, as it stands. Weeks into the process, I found it helpful - really helpful - to go back and rewrite some of what I've done. It may be my backrgound in journalism and editing, but I've always emphasized the importance of revision. This time, though, it's on a grand scale. Nor of course does it mean that the words are particularly good. The clock is ticking on my unpaid leave from work: just six weeks to go. More and more, I'm counting up and counting down, trying to keep track of what's in my head and what's been typed. For well over a month, I've been pretty obscure when people have asked how my work has been going. "Pretty well," is pretty much what I've tended to say. But I have been working on something other than some freelance assignments and consulting work as I continue my leave from the CBC newsroom in St. John's. I spent much of the first couple of months since July working with and for my wife, who is self-employed and runs a consulting company here in St. John's. But for much of my time since early September, I've been working on a book. A novel, to be precise. I've actually been telling this to people now for a couple of weeks, when they've asked what I'm up to, so I figured I might as well put it out there more broadly. Right now, I'm deep into it, and I got to the point several weeks ago where I figured that I can actually pull this off. It means having a lot less time for paid work, which certainly has its implications, but I look at it this way: I may never get an opportunity like this again. I told my family about the project a few weeks ago, and got a wonderful response, and have been talking about the project with a few good friends, whose support has been invaluable. I'm being diligent, and have been treating this like work. I show up every morning at my laptop, and write according to a schedule. I've been writing not so much in my home office, but instead in a very comfortable chair in the living room (that's it, in the picture above, with my Macbook). So there it is. I still have a lot of research to do, and quite a lot of writing. I'm hoping to have a decent draft done by the time I finish my leave, in four months' time. What happens after that (like, say, getting it published) is likely a whole other battle. But for now, I'm here in my chair, dreaming up a story I hope other people will want to read.